There are different ways for you to rip audio from DVD. There are programs you can use as a DVD audio ripper or DVD audio extractor to extract audio from DVD. There are programs that can directly convert DVD to audio files, but they are usually not free. And there are free ways to rip DVD to audio file. In this post I would present to you a DVD audio ripper that can directly rip DVD to audio file and how to use it. And I would also include instructions as to how to convert DVD to audio file for free. The most simple way to rip audio from DVD would be directly convert DVD to audio file using a DVD audio ripper. And Leawo DVD Ripper is the perfect choice for a DVD audio ripper. Not only can it convert DVD audio to MP3, it also provides a lot of other audio formats for you to choose from. It’s a typical DVD ripper that can rip all kinds of copyprotected DVDs to all kinds of video and audio files. The most appealing feature about this program is that it can do 1:1 lossless DVD to MKV conversion. It would enable users to create a lossless digital copy of their DVDs. It also allows users to rip DVD to play on Apple TV or other Apple products. Getting back to the purpose of this article, it can easily have your DVD converted to high quality audio files. Let me show you how you can rip dvd audio to mp3 using this DVD audio ripper. Step 1. Download Leawo DVD Ripper from Leawo’s website and install it on your computer. It’s not an independant program but a module packed inside a software suite called Prof.Media. 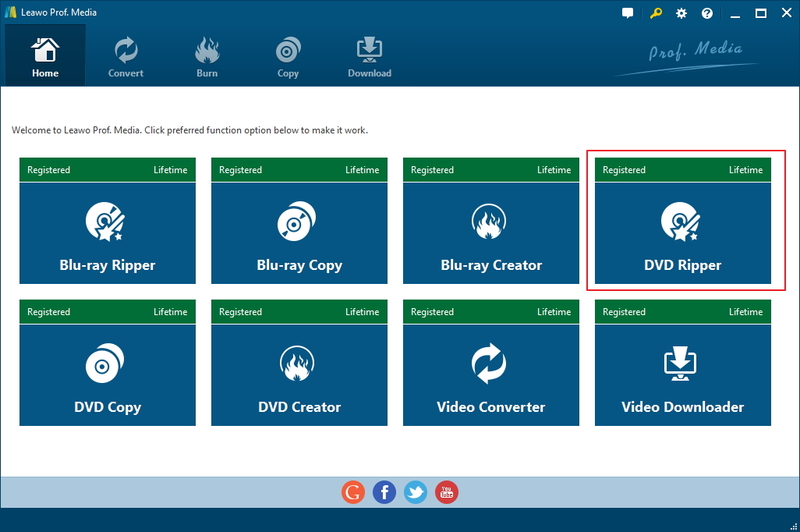 Open Prof.Media, register the program and click the DVD Ripper icon from the main interface to launch DVD Ripper. Step 2. To rip audio from DVD, first load the DVD in the program. Enter your DVD into your disc drive first so that the program can detect it and load it. In the upper left-hand corner there’s a Add Blu-ray/DVD button you can use to add the DVD to the program. You can also directly drag the DVD folder from a Windows File Explorer window to the program and drop it to import disc content. Step 3. The following page has a video player for you to directly watch the videos in the disc. You can also see 3 buttons on top of the left column and a list of all the videos in the disc. The program doesn’t force you to rip and convert all the videos at the same time. Instead, it offers you with 3 options for choosing what videos in the disc to convert to audio files. You can use Custom Mode to choose multiple videos from the list. If you click on the Full Movie button, then all the videos on the list will be selected. Main Movie will only select the longest video in the disc. Click OK to move forward. Step 4. The videos you chose from the last step can be seen added to the video list. Next thing to do is set what audio format you want to rip the DVD videos into. Move your mouse onto the second button from the right on the row of buttons above the video list. It’s a button that you can see the default output format on. For convenience’s sake, let’s call it the Format button. By clicking on it there will be a popup below it with 3 new buttons. The Change button is what we need here to get to the Format list, so click on it as you see it. And then find the audio format you need. After finding the ideal audio format, directly click on that format to make it the default output format so that when you start ripping the disc later, the videos will be converted into that format. Step 5. Click the Convert button and select a folder to save the audio files in on the following sidebar. And there will also be another Convert button on the sidebar which you can use to start the DVD to audio conversion. After setting the folder, you can click on the Convert button to start ripping audio from DVD with this DVD audio ripper. Leawo DVD Ripper is sold at $29.95 for a one-year license. If you want to rip your DVD discs to videos other than use it to rip audio from DVD, then it’s worth the price. If the price tag is a deal breaker for you, there’s a way you can do this for free. The instructions below will show you how to rip DVD to audio for free. It would be more complicated than using Leawo DVD Ripper, but it’s free. 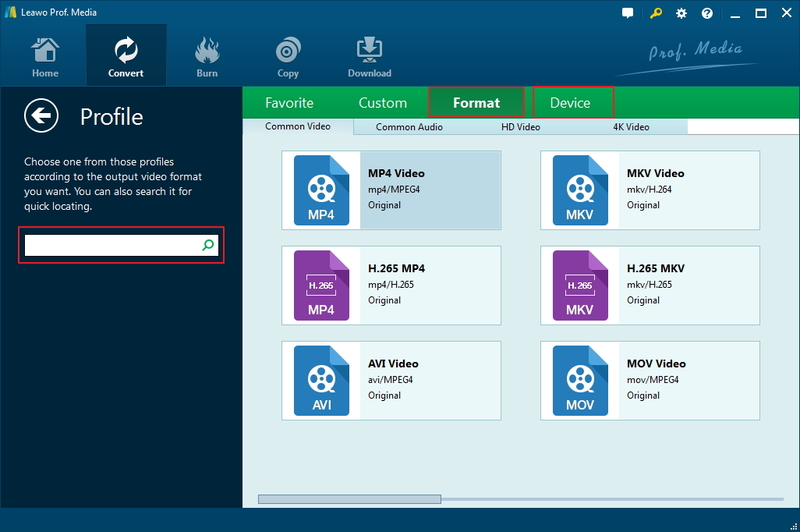 The procedure includes using Handbrake to rip DVD to MP4 and using a free online video converter to convert MP4 to audio files. The first program we need is Handbrake. Handbrake can rip DVDs, but only unprotected ones naturally. To enable Handbrake to rip protected disc, go find a file named libdvdcss-2.dll online, download it to your computer and put it in Handbrake’s program folder. That should enable Handbrake to rip protected DVDs. Launch Handbrake and follow the instructions below. 1. Click Source below the menu bar and select your DVD to load the videos in the DVD disc. 2. Click the option box next to Title. The drop-down menu contains all the video titles in the disc. If you need more than one title in the disc, then you will have to add them to the ripping list one by one. Select one video from the Title drop-down list and click Add to Queue. You might have to repeat this step when you need to add multiple videos. 3. Select a preset profile from the presets Handbrake provides. It doesn’t matter much as that’s not the most important part. Just select one from the list and move on to Step 4. 4. Click the Browse button to select a folder on your computer to store the output videos, you will also have to give a name to the output file. 5. Click Start to start ripping the DVD disc. After getting the video in the DVD disc ripped to your computer, the next thing to do is to convert the videos from DVD to audio files with an online video converter. There are a lot of online video converters you can use, most of them would be able to get the job done. Here let’s take onlinevideoconverter as an example to show you how to convert the videos you get from your DVD to audio files. 1. Go to onlinevideoconverter’s website and click CONVERT A VIDEO OR AUDIO FILE. 2. 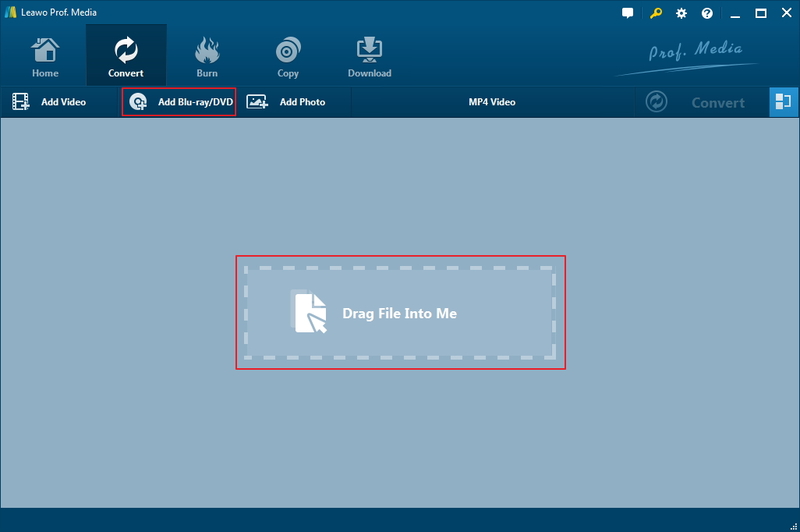 Drag the video files to the website to upload them. 3. Select an audio format. 4. Click Start to start converting the video from DVD to audio files. 5. Download the audio files from the website to your computer after the conversion is done. This is the free way to convert DVD audio to MP3 without using a DVD audio extractor. As you can see, it’s more complicated than using Leawo DVD Ripper. If you don’t mind going through all those troubles, then you can use it to convert DVD audio to MP3.